E-Prime can use a single or multiple monitors simultaneously to run experiments. E-Prime also has the capability to adjust the desktop resolution during experiment runtime, refresh rate, screen orientation, and color options. A Display is added to the experiment by default. E-Prime enhancement of using display back buffer flipping, which is enabled by default for new experiments. A flip operation in technical terms is an operation performed in the display adapter hardware where it chooses between two different display areas (canvas) without having to copy the entire contents from one area to the next. The primary benefit for E-Prime users for this enhancement is to ensure that displays are synchronized with the vertical blank, which avoids the likelihood of tearing where the partial contents of one display appear torn between the previous display contents. When using DisplayDevice.FlippingEnabled = Yes (default), experiment authors should take care when using Canvas scripting or the .Draw object. Any drawing operation will perform a Flip operation. Thus, using any drawing commands such as Line, Circle, etc. should be performed on an off screen canvas and then brought to the screen using Canvas.Copy. The use of Display.WaitForVerticalBlank which is necessary to sync to the vertical blank before performing a Canvas.Copy command is not required when DisplayDevice.FlippingEnabled = Yes and will actually be of a detriment , because doing so would result in two refresh cycles (one for .WaitForVerticalBlank and one for Canvas.Copy) to occur. E-Prime includes RefreshAlignment. RefreshAlignment is the ability for the display scheduling in E-Prime to start an object early if the next refresh is just prior to the next target onset time of an object. For example, assume that the next object in a trial is has a NextTargetOnsetTime of 5532. The DisplayDevice reports that the next vertical blank sync is scheduled to occur at time 5530. Without RefreshAlignment, this would result on a 60 hz monitor having Object B starting at time 5546. With RefreshAlignment, the system would detect that the next refresh is just prior to the next target onset time and start Object B at time 5530. Even when specifying a Duration value for objects that is divisible by the refresh rate, eventually an object will run into a situation where it would benefit from RefreshAlignment, because its schedule time occurs just after a refresh event occurs. For example, on a 60 hz monitor, the refresh rate is 16.666666ms. Since that floating point number is not evenly divisible by an integer capable of being specified for the Duration property, having RefreshAlignment allows for the system to be adjusted to sync when the floating point overflow would occur. The RefreshAlignment is specified in terms of a percentage of the refresh rate. The default rate is 25%, and the maximum value is 75%. The RefreshAlignment is set on the DisplayDevice property pages. With RefreshAlignment, an experiment increases the chances for objects to have two small display timing errors because it shortens one object and lengthens the display time for the second. 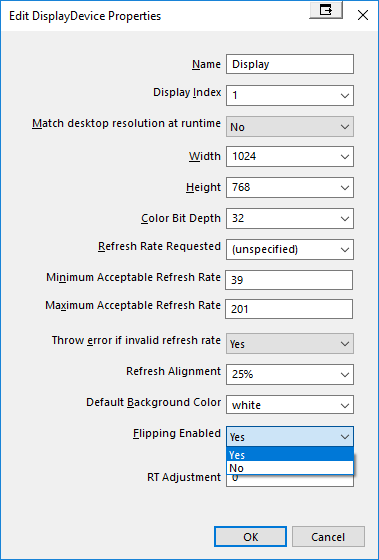 This is viewed by many paradigms as being a better solution than having one timing error on one display that has a significant error of being on screen for an entire additional refresh. E-Prime supports the presentation of stimuli on multiple video displays. Refer to E-STUDIO: Multiple Video Displays  for an explanation of the use of multiple monitors. E-Prime can use the Keyboard as an input device. Response presses and key assignments can be designated. Also, AutoResponses for E-Run test can be designated here. A Keyboard is added to the experiment by default. See E-STUDIO: Auto Response  for further information. E-Prime can use the Mouse as an input device (See E-STUDIO: Input Devices ). Response presses and curson options can be designated. A Mouse is added to the experiment by default. See also E-STUDIO: Touch Interface Support  for information pertaining to mouse device support for touch interfaces. API options can be selected in the Sound object. Drivers can be configured for sound drivers as well. Sound is added to the experiment by default. See E-STUDIO: Sound Devices  for further information. E-Prime can use button devices to collect responses during an experiment. Response types include a press down, click, double click, hover, long press, fixation, and check. Button options can be selected here. The ability exists to edit Button Themes. A Button Device is added to the experiment by default. See E-STUDIO: Button Device  for further information. Allows you to time lock E-Basic script to E-Object based events. The Script device is added to the experiment by default and cannot be edited or removed. See OVERVIEW: Extending Experiments with Script  for further information. The Chronos Response box can be added to any experiment on machines in which Chronos is installed. It is not added to an experiment by default. For more information on Chronos options, please refer to the Chronos Operator's Manual or the Chronos Command Reference. See INFO: Chronos as a Response Device  for further information. E-Prime can use a single or multiple joysticks as an input device. Response presses and cursor options can be designated. Joysticks are not added to an experiment by default. See INFO: Joystick Device  for further information. E-Prime is capable of sending a signal to the parallel port for interfacing with an external device. The receipt and handling of the signal by the other machine is the responsibility of the user. A ParrallelPort is not added to an experiment by default. See INFO: General Parallel Port Information  for further information. E-Prime is capable of sending a signal to the port for interfacing with an external device. The receipt and handling of the signal by the other machine is the responsibility of the user. Port Communication is not added to an experiment by default. See INFO: Using the Port Device in E-Prime  for further information. E-Prime is capable of sending a signal to a serial port for interfacing with an external device. The receipt and handling of the signal by the other machine is the responsibility of the user. Serial Communication is not added to an experiment by default. See INFO: Serial Communication in E-Prime  for further information. E-Prime is capable of sending a signal to the socket for interfacing with an external device. The receipt and handling of the signal by the other machine is the responsibility of the user. A Socket is not added to an experiment by default. See INFO: Add a Socket object or device to support TCP/IP communications  for additional information. SoundCapture devices can be added to experiments in which audio needs to be recorded from participants. Settings on Channels, Samples, and Bits per Samples can be adjusted here. SoundCapture is not added to an experiment by default. The Serial Response Box can be added to any experiment as an alternative input device (See E-STUDIO: Input Devices ). The Serial Response Box features 5 lamps, and 5 keys. It is not added to an experiment by default. For more information on the SRBox, refer to the Products section of the PST website.